Mackie HR824 active monitorsWhen talking about the Mackie HR824 active studio monitors there is much to be said. Not only because of the wide spectrum coverage but also the 250 Watt power used to deliver the sound as Mackie only can with this industry standard. 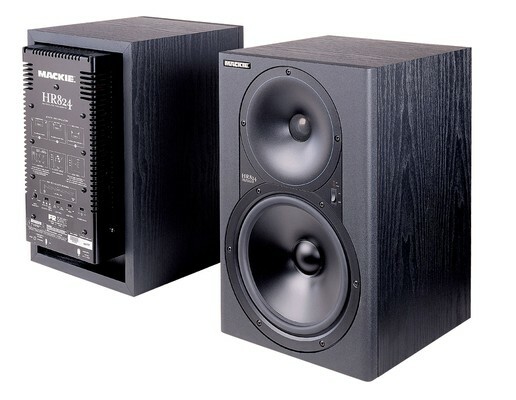 Unlike other studio monitors the Mackie HR824 offer a full but objective sound range that does not make any favors. Like that you can create hearing the true colors of your sound. Once you get used to the sound in relation to the output of your stereo you can start making tweaks to refine and fatten your bass range. Reaching 37Hz gives a round and tight bass line that helps building all the remaining sounds on top. With prices starting at Â£669.00 the Mackie HR824 does not come cheap but delivers value by helping you improve the sound spectrum.